Rostov is a town in Yaroslavl Oblast, Russia, one of the oldest in the country and a tourist center of the Golden Ring. It is located on the shores of Lake Nero, 202 kilometers (126 mi) northeast of Moscow. Population: 31,792 (2010 Census); 34,141 (2002 Census); 35,707 (1989 Census). Kostroma is a historic city and the administrative center of Kostroma Oblast, Russia. A part of the Golden Ring of Russian towns, it is located at the confluence of the Volga and Kostroma Rivers. Population: 268,742 (2010 Census); 278,750 (2002 Census); 278,414 (1989 Census). Staraya Russa is a town in Novgorod Oblast, Russia, located on the Polist River, 99 kilometers (62 mi) south of Veliky Novgorod, the administrative center of the oblast. Its population has steadily decreased over the past years, going from 41,538 recorded in the 1989 Census to 35,511 in the 2002 Census to 31,809 in the 2010 Census. Valday is a town and the administrative center of Valdaysky District in Novgorod Oblast, Russia, located on the southwestern shore of Lake Valdayskoye, the biggest one in the set of lakes in the highest region of the Valdai Hills, on the M10 Highway connecting Moscow and St. Petersburg, 386 kilometers (240 mi) from Moscow and 140 kilometers (87 mi) from Veliky Novgorod, the administrative center of the oblast. Population: 16,098 (2010 Census); 18,703 (2002 Census); 19,173 (1989 Census). 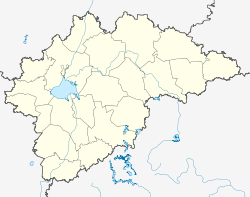 Veliky Ustyug is a town in Vologda Oblast, Russia, located in the northeast of the oblast at the confluence of the Sukhona and Yug Rivers. As of the 2010 Census, its population was 31,665. Chudovo is a town and the administrative center of Chudovsky District in Novgorod Oblast, Russia, located on the Kerest River. Population: 15,397 (2010 Census); 17,434 (2002 Census); 17,982 (1989 Census). 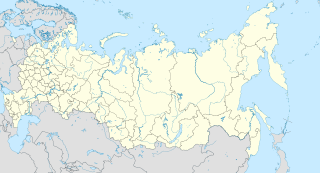 Kholm is a town and the administrative center of Kholmsky District in Novgorod Oblast, Russia, located at the confluence of the Lovat and Kunya Rivers, 77 kilometers (48 mi) north of Toropets, 93 kilometers (58 mi) southwest of Staraya Russa, and 201 kilometers (125 mi) south of Veliky Novgorod, the administrative center of the oblast. Population: 3,830 (2010 Census); 4,325 (2002 Census); 4,849 (1989 Census). Pestovo is a town and the administrative center of Pestovsky District in Novgorod Oblast, Russia, located in the Valdai Hills on the Mologa River. Population: 15,903 (2010 Census); 15,990 (2002 Census); 15,941 (1989 Census). Soltsy is a town and the administrative center of Soletsky District in Novgorod Oblast, Russia, located on the left bank of the Shelon River, 78 kilometers (48 mi) southwest of Veliky Novgorod, the administrative center of the oblast. Population: 10,086 (2010 Census); 11,264 (2002 Census); 11,782 (1989 Census). 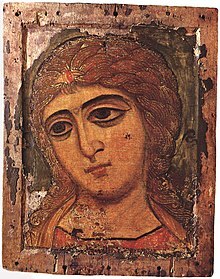 The Saviour Church on Nereditsa is an orthodox church built in 1198. It is one of Russia's oldest churches. The Transfiguration Church, located in Novgorodsky District of Novgorod Oblast, Russia, 1.5 kilometres (0.93 mi) south of Veliky Novgorod in the village of Spas-Nereditsy on the right bank of the Maly Volkhovets River on a small Nereditsa Hill next to the Rurik hillfort. 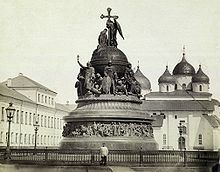 Historic Monuments of Novgorod and Surroundings is a composite World Heritage Site which includes a number of medieval monuments in and around Veliky Novgorod, Russia. The site was inscribed in 1992.